Fr Seán Brady, is a native of Drumcalpin in Laragh Parish. Born in August 1939, he was educated at Caulfield National School, St Patrick’s College Cavan, St Patrick’s College Maynooth, and the Irish College in Rome where he was ordained in February 1964. He received a Doctorate in Canon Law at the Lateran University in 1967. He was first appointed as professor in St. Patrick’s College Cavan from 1967-1980. In 1980 he was appointed Vice-Rector of the Irish College Rome and became Rector of the College in 1987, he returned to Ireland in 1993 to become Parish Priest of Castletara. 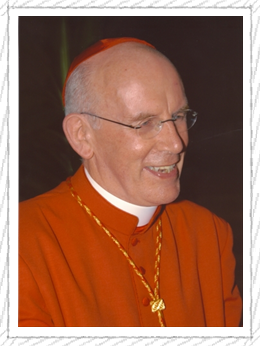 On 19 February 1995 he was ordained Coadjutor Archbishop of Armagh and when Cardinal Cathal Daly retired, Dr Seán was ordained Archbishop of Armagh and Primate of All Ireland on the 3rd of November 1996. In November 2007 Pope Benedict announced that Archbishop Seán was to created a Cardinal on November 24th2007. The people of Laragh are very proud of Cardinal Seán and are constantly praying for him in his work. The people of the parish of Laragh are delighted that Archbishop Seán Brady, who was born and reared here, is to be created a cardinal by Pope Benedict XVI. “Fr Seán” as he is known affectionately in his native parish sums up in his own person everything that is best in any human being. He is warm, friendly and interested in everyone. He is a humble man with deep Christian faith and charity; no doubt he will continue to live out the saying of Jesus “the greatest among you must be the one who serves”. This is a great honour for him, his family, the people of Laragh, the people of Cavan and the whole Diocese of Kilmore. We heartily congratulate him and send him our very best wishes. A large number of people from Laragh travelled to Rome for the Consistory where Archbishop Seán Brady was made Cardinal by Pope Benedict XVI. Saturday 24th November saw the Consistory in which 23 men were made Cardinals in St Peter’s Basilica. As well as receiving the red biretta, Cardinal Seán was given charge of a titular church, Ss Quirico & Guiletta, in the heart of the historical centre of Rome. The new Cardinals were greeted by family, friends and well wishers on Saturday evening. On Sunday 25th November each Cardinal received the Cadinalatial Ring during Mass to celebrate the feast of Christ the King. Monday was a very special day for the people of Laragh. Cardinal Seán celebrated Mass in the Basilica of St. John Lateran where the clergy and people from Cavan and Armagh joined him to celebrate this wonderful occasion. Afterwards a reception was held for all in the Irish College.